For the past two decades Brian Bedford has been Stratford’s go-to director for Noel Coward. He directed Blithe Spirit (1941) in 2013, Fallen Angels (1925) in 2005, Present Laughter (1942) in 2003 and Private Lives (1930) in 2001. One reason Bedford had the knack for Coward was that he worked with the master himself. Now Stratford is staging Hay Fever (1925) without Bedford at the helm. It is one of Coward’s most glittering comedies but one that Coward himself knew was the most difficult to pull off. Director Alisa Palmer has missed the entire point of the play and as a result the prime source of its humour. The plot of Hay Fever is almost more of a situation than a plot. We are in the country house of David Bliss (Kevin Bundy), a novelist who just about to finish his latest work. His wife Judith (Lucy Peacock), is a star who has recently retired from the stage but is thinking of making a comeback by reviving one of her old hits, the melodrama Love’s Whirlwind. The Bliss’s grown children Sorel (Ruby Joy) and Simon (Tyrone Savage), a painter, are also at home. The twist is that each of the four members of the family, unbeknownst to the others, has invited someone down for the weekend. Judith has invited Sandy Tyrell (Gareth Potter), a tennis player who has a crush on her. Simon has invited the young socialite Myra Arundel (Cynthia Dale). Sorel has invited the diplomat Richard Greatham (Sanjay Talwar). And David has invited the ordinary girl Jackie Coryton (Ijeoma Emesowum), in order to study her for his novel. The joke is that the Bliss family members are so self-involved that they do little or nothing to welcome or entertain their guests. The family is more preoccupied with entertaining each other. This leads the guests eventually to pair off, but not with the person who invited them, and finally to decide to leave the eccentric family to itself and escape. Where Palmer goes wrong is clear from her Director’s Notes. According to Palmer, “Hay Fever tells the story of a young woman trying to break free of her family to forge an independent – and more “normal” – identity. It also tells the story of a successful professional woman at mid life, who is experiencing a crisis of identity”. What Palmer gets completely wrong is that this “mother-daughter power struggle”, as she calls it, is not the centre of the play, but it does explain why of the nine characters in the play, she pays attention two only these two. 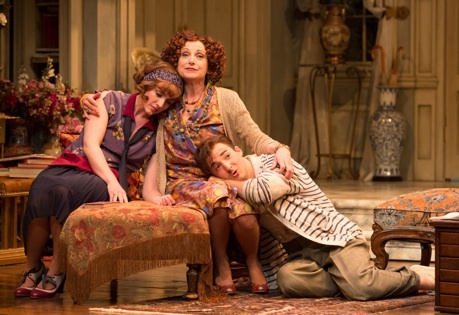 What Palmer crucially fails to recognize is that the engine that drives the play and generates its humour is the contrast between the Bliss family and their guests. Judith Bliss may have retired from the stage but she has not retired from acting. In fact, she is acting all the time so that eventually you wonder if you ever get glimpse as the “real” Judith Bliss, if there is one. Rather than ignoring her, the Bliss siblings respond to Judith’s acting by acting themselves. This culminates twice in the play when Judith, Sorel and Simon all spontaneously act out parts of Love’s Whirlwind. In a truly fine production of Hay Fever, such as that at the Shaw Festival in 2002 directed by Christopher Newton, we should note the gradual shift in acting in Judith from mere hyperbole to the full-on playing of a role. Similarly, in the Bliss children we should see how they interact normally compared to how their mother’s presence draws them into greater expressions of artifice. Sorel says outright to Sandy, “One always plays up to mother in this house: it’s a sort of unwritten law”. We should also see how David Bliss, absent-minded and self-absorbed as he is, gets as caught up in playing a part and arguing for its own sake as do the rest of the family. Newton’s direction was so nuanced that he let us see character traits of both parents at work in their two offspring. Palmer, in contrast, neglects the Bliss family dynamics entirely, including the “mother-daughter power struggle” she claims is so important. This is clear right from the start of the action when Sorel and Simon are conversing alone. This scene should give us a view of the children before their mother’s entrance ignites the acting mode in both of them. Palmer does have Ruby Joy play Sorel in a jaunty unaffected manner, but she allows Tyrone Savage to be insufferably artificial. After each of his statements he faces the audience and raises his eyebrows or mugs as if to say “Wasn’t that clever”. Because of this Palmer misses the most important chance to show how a conversation between the siblings without their mother differs from one with their mother – this contrast, being one of the aspects of the play’s humour. Unlike Fiona Reid for Newton in 2003, Lucy Peacock does nothing to differentiate the various degrees of acting in Judith. The way Peacock and Savage play their melodramatic roles in Love’s Whirlwind is no different from what Palmer presents as their usual overheated interactions. As usual, lack of variation in tone soon becomes tedious. Palmer seems to have given no thought to David Bliss at all with the result that Kevin Bundy’s performance is severely undercharacterized. His David is so retiring that he not only does not match the other three actors in presence, but hardly seems to be there at all. It is important to establish the workings of the self-contained world of the Bliss family so that we can better appreciate the comic befuddlement of the guests in having to deal with it. Because Palmer does not do this, she produces only minimal results in comedy when the guests arrive. To make matters worse, Palmer does nothing to establish the distinctive nature of the guests so that we wonder how such a mixed group could ever get along. Gareth Potter’s athlete, Sanjay Talwar’s diplomat and Ijeoma Emesowum’s flapper are all equally meek. Only Cynthia Dale’s socialite has some spark, but Palmer has her say her lines and immediately retire again to the background. We have no sense of her as the “self-conscious vampire” Judith calls her. madhouse of the Blisses, Talwar’s diplomat sneaks down to the breakfast buffet and accidentally drops a piece of haddock on the floor. The silent comedy of his moral dilemma whether or not to put the soiled haddock back into the serving tray is truly priceless. The role of the Bliss’s maid Clara, who had previously been Judith dresser, can be extremely funny, but Palmer seems to have given Sarah Orenstein no clue what to do with the role. We also don’t know whether the terrible wig Orenstein is wearing is meant to be Clara’s actual hair or just a terrible wig. Physically, the production is gorgeous. Douglas Paraschuk has created an extraordinarily elaborate and minutely decorated set for the “hall” where all the action takes place that reflects in its eclectic collection of paintings, objets d’art and books the “artsy” inclinations of the family while windows surrounding an elegantly curved staircase stage left give a view of the Bliss’s conservatory where nature itself is cultivated under artificial conditions. Dana Osborne’s costumes capture the period perfectly and make one wonder if there was ever a more stylish decade in the 20th century than the 1920s. Palmer, apparently not finding enough comedy in the text, has decided there should be comedy in the set. The main physical joke of her production is that something is wrong with one of the steps of the grand staircase. What it is is never clear. Is it slippery? Does it wobble? Who knows. The joke is that all the guests stumble on that one step going to and from their bedrooms while the Blisses habitually skip over it. Palmer also thinks it is funny to have guests repeatedly sit on books in chairs by accident. These are the kind of physical gimmicks that rapidly decrease in effectiveness with frequency of use. Palmer has directed comedy before, most notably The Women (1936) by Clare Boothe Luce at the Shaw Festival in 2010. Hay Fever, however, which she oddly considered a “feminist” play, finds her all at sea, trying to turn Coward into Chekhov and in the process blinding herself to the basic structure of the comedy. With the exception of the two scenes with Talwar noted above, the result is the most tiresome production of Hay Fever I have ever seen. It’s a real pity for the actors involved and especially for the audience. Photos: (from top) Members of the company in Hay Fever; Ruby Joy, Lucy Peacock and Tyrone Savage; Lucy Peacock as Judith Bliss. ©2014 Cylla von Tiedemann.